Distributor for 134-4 Cyl. 12 Volt engine restoration projects. This Distributor features state of the art electro-magnetic pickup and a built-in electronic control module. 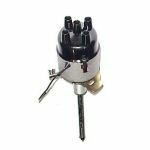 With the hookup of the two simple wires (installation instructions included), this distributor will improve the performance and driveability of any 12-volt 134-engine. No more fooling around in trying to get the points adjusted to the correct setting. Just drop in, plug in, and go.